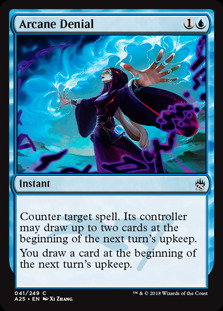 9/16/2007 The controller of the countered spell doesn’t choose how many cards to draw until the relevant ability resolves. The player may draw 0, 1, or 2 cards. They choose the number before drawing any cards. It's not Ferguson art but she does look pretty awesome. I'm not sure how they would illustrate properly the card disadvantage aspect of this card.